Hey teachers! Does your class need a change of pace? Do you like to bring hands-on education into your classroom? Are you looking for a unique way to captivate your students? Do you want to mix up your routine syllabus with something different? ​Then you need Jungle Jill’s Animal Encounters! 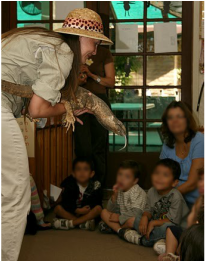 Jungle Jill brings LIVE animals right into your classroom to educate children about the animals, their habitats, their adaptations, and anything else you are looking for. Below are the details of some of the different options offered for school programs. All programs can be customized to meet your needs based on curriculum, class size, age of children and budget. THIS PROGRAM IS LOVED BY TEACHERS OF ALL GRADE LEVELS! mix and match from the different categories to have a variety of different animals. Jungle Jill talks a little bit about each animal and also leaves about 10 minutes for questions and answers at the end of the program. Some of the animals are hands on and some of them are not. 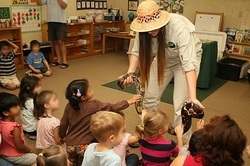 However, touch-ability of the animals also depends on the number of children at each show. Programs can be presented for any group size, but smaller groups (approximately 1 classroom) get to do more hands on. The show content is geared towards the grade level of the children in attendance. It is great for all ages! ​The program described above is $300. If want to keep the group size down and keep your classes separate by having multiple shows in one day, each additional show at the same location is only $150. You get a huge price break once you get Jungle Jill there! HANDS ON OPPORTUNITIES FOR PRESCHOOLERS ARE PRICELESS! For little ones, preschool and younger, the program is conducted and priced as described above in the presentation package ($300). However, it is highly recommend for preschool groups to have children in small groups (15-30 children) with a lot of hands on to help keep their attention span a little longer. Shows for the really young ones are sometimes a little shorter as well, 30 minutes, rather than an hour. THIS IS GREAT AS A FUN REWARD PROGRAM FOR THE WHOLE SCHOOL! Other options are available. We can vary programs to meet your budget, your number of groups and group size. Just ask!